From lighting up Euro 2004 to being booed off in South Africa. International tournaments have been frustrating for England's star player. The British media has tried to make Euro 2012 into a fairly humble affair as far as England’s chances are concerned. Most are expecting Roy Hodgson’s men to emerge from the group stages but after that there is a sense of pessimism and realism. A potential meeting with World and European Champions, Spain, in the quarter final doesn’t help this view. This article will investigate this prediction and will analyse why Wayne Rooney, despite his suspension, is once again the man that England fans will turn to if England are to surpass their downplayed expectations. To explain why expectations are so low, it would be easy to point to an abject performance at the 2010 World Cup which featured England scraping through the group stages (that was hilariously dubbed “EASY – England, Algeria, Slovenia, Yanks” by a certain newspaper) before being completely humbled by an energetic and brilliant Germany. But realistically, this was just another step towards the current perception. England, in the past, has had a habit of finding scapegoats for accounting for their failure (or, as I would prefer to say, disappointment). But 2008 was a much more humbling experience as England were forced to watch what was, in my opinion, the greatest international tournament of all time from the sidelines. England’s expectations and the problems Hodgson faces (and has already faced) has been written about excessively over the past few weeks. One of those questions is “who will play up front while Rooney is suspended”. Not many, to my knowledge, have truly highlighted how vital Rooney could be to England’s chances both positively and negatively. The negative aspect goes without saying: England without Rooney is obviously worse than England with him and his absence could prove costly in those two opening games. In England’s final qualifier against Montenegro, Wayne Rooney was sent off for kicking out at centre back Miodrag Džudović. This resulted in what was initially a 3 match ban that was, rather fortuitously, reduced to just two and it applies for all competitive England fixtures. What this means is that Wayne Rooney will miss England’s first two matches: their opener against France in Donetsk tomorrow and their match against Sweden in Kiev. Rooney was still picked for the tournament despite only being guaranteed to start one game, which exemplifies his importance to the team. He is arguably England’s finest player, certainly amongst attacking talent: Rooney alone scored 35 goals last year, which is only just less than the combined total of the other strikers in the England side: Jermaine Defoe, Andy Carroll and Danny Welbeck. Hodgson would have had to have been brave or crazy to omit Rooney even with his suspension. Anyone that has watched Rooney this season for Manchester United knows what a phenomenal talent he truly is. He is one of the definite reasons why Man Utd, despite claims that this is their “weakest team in years” (not my words), were able to compete with big spending Man City. He may have missed out on Player of the Year to Robin Van Persie, but Rooney’s performances are even more stunning when you consider that his goals per minute ratio was superior to Van Persie’s, despite Rooney playing several games out of position – in particular when Man Utd were short on central midfielders. In terms of an all-round player, few can match Rooney at his absolute best: not only has he been prolific in front of goal, but he’s also an intelligent player with an excellent eye for a pass with the skill to execute it – just to name a few of his outstanding traits. And when he plays to his full potential, he is pretty much unplayable. 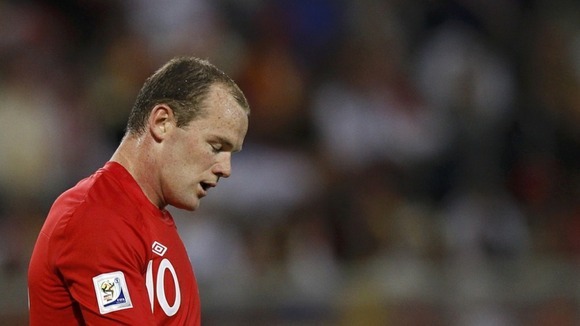 Rooney’s performances at international tournaments has, at best, been a mixed bag. 2004 seems like a long time ago but this tournament was most notable for three things: the biggest shock victory for any nation when Greece took the championship; the dazzling Czech Republic team; and the performances of a then-18-year-old Wayne Rooney. His four goals in the group stages, as well as excellent performances in all three games earned him a spot in the UEFA Team of the Tournament and his four goals left him just behind top goalscorer, Milan Baros. Many England fans will tell you that, because of Rooney’s exceptional performances in the early stages of the tournament that, had he not been injured in the Quarter Final match against Portugal, England would have gone on to win the whole tournament. Rooney scores his second goal against Croatia and his fourth of Euro 2004. Unfortunately, this remains Rooney’s last goal at a major international tournament. From there, the sky was the limit for Rooney. He completed a record setting move to Manchester United that summer and was well on his way to being one of the top footballers in the world. Fast forward two years and Rooney once again had the opportunity to light up at an international level. England’s performances in the early going of the 2006 World Cup were not impressive. They scraped results against weaker teams and Rooney ended the tournament with 0 goals, although he was injured for the first two games. He did, however, make headlines against Portugal in the quarter finals, when he saw red for stamping on Ricardo Carvalho. It was an act of frustration and rage from a player who had seen his tournament blighted by injury, poor performances and a lack of cohesion in the team. England slumped out at the quarter final stage for the 3rd consecutive tournament and Rooney’s act of rage was the defining moment of their tournament. In 2008, Rooney couldn’t prevent England from failing to qualify for the finals. His next chance to impress at international level was in the 2010 World Cup. The season leading up to the tournament was an exceptional one for Rooney as he scored over 20 Premier League goals in a season for the first time in his career and finished with 34 goals in total. England breezed through qualifying and with the “EASY” group, expectations were high once again. The tournament itself can only be described as an unmitigated disaster for England. They drew with the USA in the first game, which isn’t the worst result ever considering the USA’s improvements in recent years. In the second game, England drew 0-0 with Algeria in perhaps the most excruciating game of football in history. It’s telling that the only noteworthy part of this game was a bird that found comfort on top of the Algerian goal and Rooney’s reaction to England fans booing the team after the match. It was frustration from Rooney, who had been poor once again and frustration from the England fans for another atrocious performance. A Jermaine Defoe goal saved England from dropping out at the group stages but a second place finish in their group meant that England were now up against a brilliant Germany team who outplayed England for all but 5 minutes of the first half of the match. Rooney, once again, was anonymous. England have gone into every tournament recently pinning a lot of their hopes on Wayne Rooney. However, a record of 0 goals in both international tournaments since Euro 2004 is an unacceptable return from England’s premiere striker. When he presumably takes the field against Ukraine on June 19th, it will be nearly 8 years to the day since he last scored at a major international tournament. This time around, there is less pressure on Rooney because of his absence in the first two games and because of low expectations in general. In a worst case scenario, England could bring Rooney back into the team for that last match against Ukraine with nothing to play for at all. Wayne Rooney’s link up play with Manchester United teammate Ashley Young will be vital to England’s attacking threat in the later stages of the tournament. It is important to stress how important Rooney could be to England’s chances. If England are to progress further than their predicted quarter final finish this time around, they will need top performances from their star players and with question marks over their three other strikers, Rooney’s role is even more vital. Make no mistake, the pressure right now is off Rooney. When England play France and Sweden, it’s not Rooney’s responsibility to produce a positive result. But it will be right back on him by the time the match against Ukraine comes along and England fans will once again be looking to him to provide the spark that ends 46 years of hurt. “The Missing Man” is not simply a reference to Rooney’s absence in the first two games. As mentioned earlier, 0 goals from 2 tournaments since then is not an adequate return for a player of Wayne Rooney’s calibre. I don’t want to talk too much about pressure and expectations because I don’t know what goes on in a player’s head. I can’t say that a player like Rooney – who is a Champions League winner, a player that scored a fine goal in a Champions League final and scored a ludicrous winner against United’s local rivals – succumbs to the pressure of representing his national team at a major tournament. Instead, I think it’s better to look at the role he will be expected within this England side and why it is so vital for him to be on the top of his game. Under Hodgson, I fully expect England to be defensively solid and to play to their biggest strength, which is their back line. Players such as Scott Parker have come out recently talking about the defensive discipline that will be required of himself and his central midfield partner, Steven Gerrard. This isn’t like the England of old which had numerous world class attacking midfielders to choose from like Gerrard and Lampard. This is an England side in transition, with players like Gerrard being reduced to a more subdued role. The key to England’s success won’t be how they do defensively, because they should be set to go with an excellent backline backed up by one of the world’s finest goalkeepers in Joe Hart. Rather, their success will be determined by the efforts of their attacking outlet – in particular the likes of Rooney and Ashley Young. Under Hodgson’s expected 4-4-1-1 formation, Rooney should play behind the main striker, whether that be Danny Welbeck or Andy Carroll. With Gerrard in a subdued role it should fall on Rooney to be the link, at least in the latter games of their tournament, between attack and defence. Rooney looked isolated and frustrated playing high up the pitch against Germany, Algeria and the USA in 2010 and he was rarely able to stamp his authority on the games from this position. Shifting Rooney behind the main striker, whoever that ends up being, certainly seems to be the sensible idea and it’s difficult to imagine Roy Hodgson diverting away from his preferred system. If Rooney is left to lead the line ahead of any other strikers, expect to see his tournament be another frustrating affair for the Manchester United star. Rooney’s importance to England doesn’t come straight away but it is vital nonetheless. If Rooney is comfortable and playing in his preferred position, he could help England to a very respectable finish at the European Championships, exceeding all expectations. If not, another tournament could pass him by. Of course, all this depends on his England teammates ensuring that they can still be in with a chance of qualification to the knockout stages when England take the field against Ukraine.